Emmy came through her spay with flying colors … no problems, no issues. Whew!! Always worry when the little ones undergo surgery. Doc Sherry is great but, I still worry and am always relieved when I get the call letting me know surgery is over and they’re doing well in recovery. Given that we’ve had lots of experience over the years with dogs and surgery, we’ve added a few tricks to our bag when it comes to keeping them from licking or scratching their incisions. First up is the Elizabethan collar (e-collar) which is used only in worst-case scenarios. Looking like an evil cousin to an ugly lampshade, it is cumbersome, uncomfortable, and inhibits mobility, eating and drinking. Forget the dog sleeping in a crate with one of these as you’ll both end up losing sleep. A humane alternative to the e-collar is the Bite-Not Collar. Looking like a short stovepipe, it keeps the dog (or cat) from accessing wound areas on the body. It is much more “user friendly” and allows full mobility. On occasion, we’ve had a long-bodied dog that was way too limber and could bend enough to access the incision site. That’s usually when we do one of two things: employ the use of a “onesie” or revert back to the e-collar, with the onsie being the preferred method. 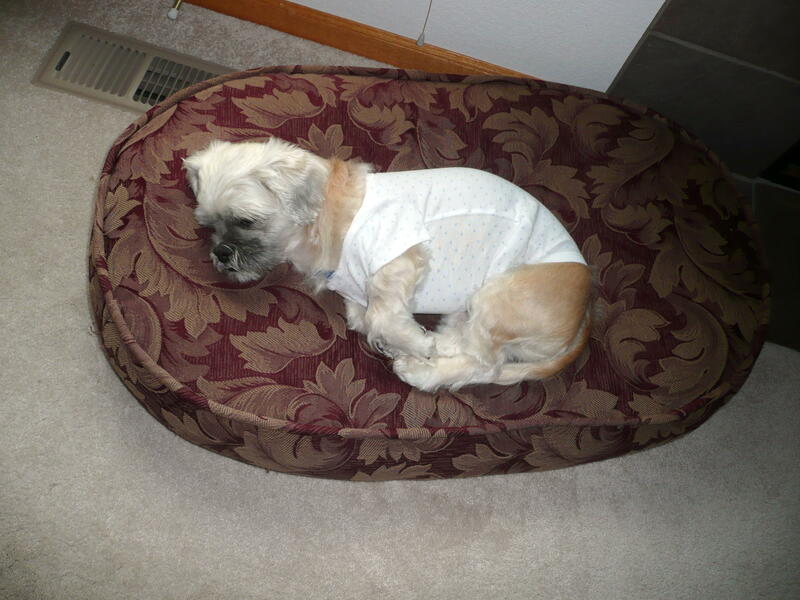 Since Emmy didn’t seem to be too interested in irritating her incision, I opted to go for comfort. She definitely didn’t like the Bite-Not and wasn’t the least bit cooperative when I put it on. And then couldn’t get comfortable with it in place. The onsie, however, was perfect. I put it on “backwards” so the crotch snaps up on the rear and not underneath the belly. With the right size, one doesn’t even have to make a hole for the tail, just snap it to one side. This also makes for a quick adjustment with a clothespin to hold the flap up for potty trips outside. Thankfully, there are other alternatives to e-collars on the market now, including a soft cone collar, an inflatable collar (the one we purchased leaked from first inflation and was returned), as well as the soft donut-type collars. I like the onesie idea. Very crafty idea!